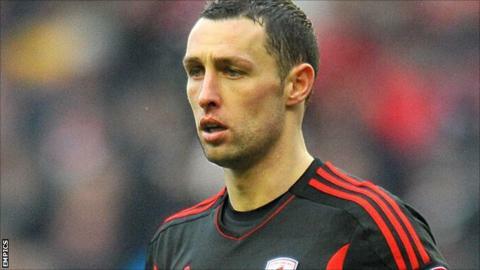 Middlesbrough manager Tony Mowbray has praised the unselfish attitude of matchwinner Scott McDonald after Saturday's 2-1 victory at Watford. The 29-year-old came on as a first-half substitute to fire the winner for Boro's first win in four league games. "I'm delighted with him today, I thought he worked hard and has a decent football brain," Mowbray told BBC Tees. "He played the left, it's not his natural position, but he didn't moan and got the goal that won us the game." McDonald has only recently returned to the first-team at the Riverside, after talks with Mowbray over the striker's future on Teesside. "I don't see any issues, for me Scott has shown over the last few weeks he can buy into what we're trying to do, be a part of our squad and be hungry to play," Mowbray added. "He has to compete with some good players, but if Scott can help the team win football matches he has every chance of getting minutes on the pitch. "The test for Scott is the day his number comes up if he starts, or the days when he doesn't even make the bench because everybody is fit and I think other players are going to do the job."